Sooooo, my 40th birthday is next year. September 18, 2018 to be exact. I have been thinking about a King project to commence on that date. I have only mentioned it to one other person (a friend of mine on Instagram) and I am pretty nervous about it. It is a huge undertaking should I wish to proceed. Well, I am ready to reveal it now to the universe. Once you put it on social media, you know it’s true! My plan is to read all of Stephen King’s published novels in order of publication date (except for The Dark Tower series, which I am reading currently and is an entity unto itself). A lot of these will be rereads for me as I have read 33 of his books and I am sure I will be reading more before the 9/18/18 date. I haven’t decided if I want to include short-story collections in this read. I would use his website, “The Library” section, organized by publication date to get the correct order. First up, of course would be Carrie and that would be a reread (as a matter of fact, the first 8 books would be rereads but they’re some of the best so who cares!?). The way he writes, this may be a project that lasts the rest of my life! I hope he continues working as he has been the past few years – although how he is doing it without using a body- or brain-double, I have no idea! A lot to think about between now and then – I just wanted to get the idea down somewhere to mull over further! Cheers to the weekend, booknerds – I hope you get a lot of pages read this weekend! 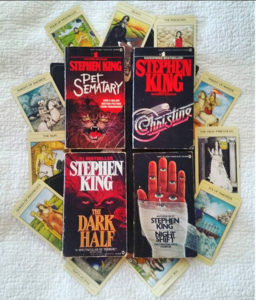 Side note: the photo above is one that I took for my bookstagram page featuring four vintage King paperbacks from my collection and my tarot cards. I just love how it came out – nerdy pride for that one.